Product prices and availability are accurate as of 2019-04-11 05:42:47 EDT and are subject to change. Any price and availability information displayed on http://www.amazon.com/ at the time of purchase will apply to the purchase of this product. 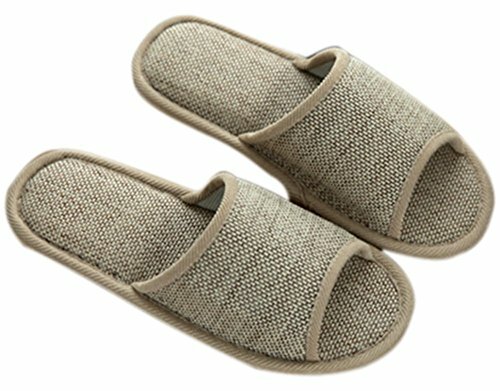 This slippers are comfortable and casual, it is specially made for the house indoor using, the main material is cotton and linen, both of them are environmental friendliness and health to the skin. The sole of the slipper is thick and strong , made by high quality synthetic Rubber which is anti-skid and well-constructed. The surface of the slipper is elegant and well-made,the style is the fashion open-toe design ,it is conveince and easy to slip on and take-off and suitable for Women and Men. Please pay attention to the size chart on the pictures before purchasing.